Distillate crack spreads (the difference between the prices of wholesale distillate and crude oil) in the Asia-Pacific region are down 37% year-to-date compared with the same period in 2015 (January 4 to May 16). Several factors behind the decline in crack spreads in the Asia-Pacific market are consistent with those in other global markets—tepid demand growth, high distillate stocks, and increased refinery runs. 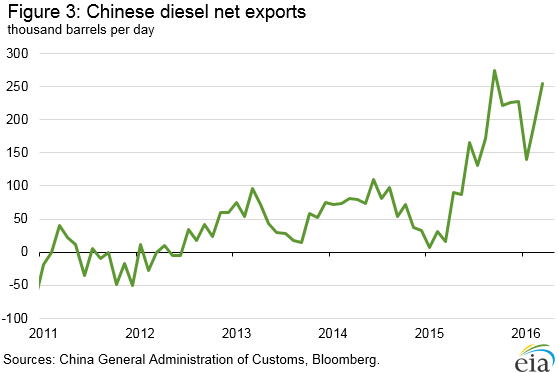 Particularly relevant to the Asia-Pacific market, however, is the emergence of China as a growing net exporter of diesel (a type of distillate fuel), which puts more product into a well-supplied market. Global distillate markets remain well-supplied from reduced winter heating demand in the United States and Europe resulting in high inventories, and from new or expanded refinery capacity in the Middle East geared to produce distillate. China, which drove distillate demand growth over the past several decades, recently increased its net distillate exports, leading to fundamental changes in Asian distillate markets and representing a further indication of the current global distillate oversupply. 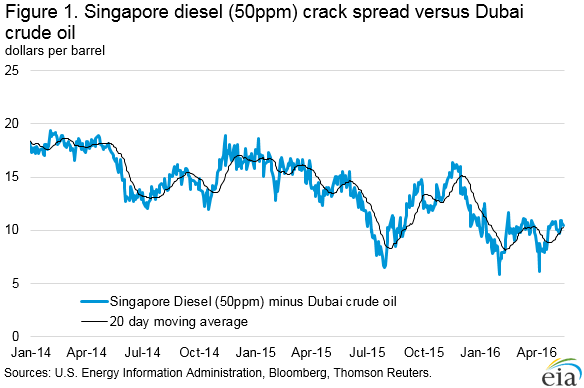 Distillate crack spreads (calculated using prices of Singapore diesel, with a sulfur content of 50 parts per million (ppm), and Dubai crude oil) averaged $9.55 per barrel from January 4 to May 16, a decrease of 37% compared with the same period in 2015 (Figure 1). Prices in Singapore are generally representative of the overall Asian market, as Singapore is a major petroleum trading, storage, and refining hub. The decrease in Asian distillate crack spreads comes as Chinese exports of distillate began to increase rapidly in 2015 driven by structural shifts in China’s economy, which are reducing diesel demand, and by reforms to China’s refining sector, which are contributing to increased refinery utilization and diesel production. The confluence of these two factors is working to push Chinese diesel into the Asia-Pacific market and depressing crack spreads, which tends to narrow profit margins for refining companies. China’s economy is gradually shifting focus from heavy manufacturing to commercial services and personal domestic consumption, affecting the types of petroleum products China uses. Typically, manufacturing-based economic growth corresponds to increased consumption of distillate fuel (including diesel) to power heavy machinery, equipment, industrial/manufacturing processes, construction, and freight transport. Services- and consumption-led economic growth typically correspond to increased demand for gasoline for consumers’ light duty vehicles, and kerosene/jet fuel for passenger air travel. The latter two fuels drove Chinese petroleum consumption growth in recent years. Gasoline and kerosene/jet fuel grew 10% and 19% in 2015, respectively, while diesel consumption was flat. As the structural shift toward gasoline consumption has increased, Chinese refineries—which tend to have high distillate yields—increased refinery runs to meet demand for gasoline. Slower demand for distillate combined with increased coproduction of distillate from refineries resulted in high inventories and increased supply in China. Simultaneously, China is in the process of reforming its refining sector by liberalizing import and export restrictions on crude oil and petroleum products, and allowing increased competition in the domestic transportation fuels market. Most of China’s refining capacity is run by two large state-owned enterprises (SOE), PetroChina and Sinopec, which together account for 72% of China’s total refining capacity. The remaining refining capacity is controlled by independent regional companies that often run small, less-complex refineries (commonly known as teapots or teakettles). To improve the efficiency of these independent refineries and increase competition in its domestic fuels markets, China began granting crude oil import licenses to some of the independent regional companies in July 2015. Previously, independent refiners mainly imported and processed heavy fuel oil, a lower-quality feedstock, and had limited access to some domestically produced crudes. 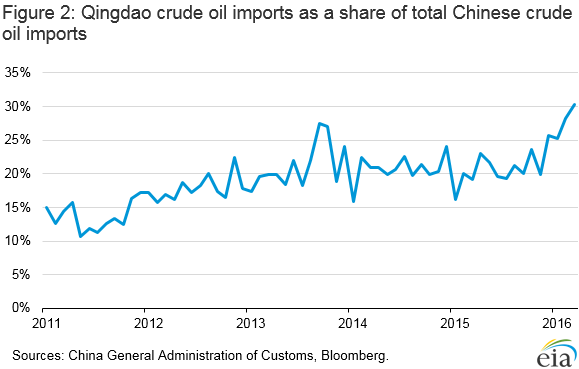 Many of China’s independent refineries are located in northeastern Shandong province, and receive crude imports from the port city of Qingdao, where crude imports as a share of total Chinese crude imports reached 30% in March, the highest since data became available in 2011 (Figure 2). Refining crude oil instead of fuel oil allows the independent refineries to improve efficiency and produce a fuel slate of higher-value products, such as transportation fuels. This is increasing competition with the SOE refineries and decreasing SOE market share in regions with independent refineries. The supplies of diesel produced at SOE refineries, which would normally have gone to serve those regions, must now find an alternative market. To alleviate the situation, China began to increase the export quota for all petroleum products, with the most recent quota announcements for 2016 double the amount allowed in the same period in 2015. As a result, Chinese net distillate exports increased from modest volumes in the first quarter of 2015 to averaging almost 200,000 barrels per day in the first quarter of 2016 (Figure 3). With global diesel markets expected to remain oversupplied and seasonally weak in the coming months, increased net exports from China could continue to pressure Asia-Pacific crack spreads. The U.S. average regular retail gasoline price increased two cents from the previous week to $2.24 per gallon on May 16, down 50 cents from the same time last year. The Midwest price rose six cents to $2.18 per gallon, the Rocky Mountain price was up three cents to $2.24 per gallon, and the West Coast price increased a penny to $2.64 per gallon. The Gulf Coast price was unchanged at $1.99 per barrel, while the East Coast price decreased slightly, remaining at $2.22 per gallon. The U.S. average diesel fuel price increased three cents from the previous week to $2.30 per gallon, down 61 cents from the same time last year. The Rocky Mountain price increased five cents to $2.32 per gallon, while the West Coast price rose four cents to $2.53 per gallon. The Midwest and Gulf Coast prices each rose three cents to $2.27 per gallon and $2.16 per gallon, respectively, and the East Coast price increased by a penny to $2.32 per gallon. U.S. propane stocks increased by 1.0 million barrels last week to 74.2 million barrels as of May 13, 2016, 3.2 million barrels (4.5%) higher than a year ago. Midwest and Rocky Mountain/West Coast inventories increased by 0.8 million barrels and 0.3 million barrels, respectively. East Coast and Gulf Coast inventories remained essentially unchanged, with a modest increase and decrease, respectively. Propylene non-fuel-use inventories represented 5.4% of total propane inventories.